The relevance of this plaque will become obvious when you read on. “I'd like to share something with you, my friends. I received a phone call last night from someone I don't really know. If interested, take a look, it speaks volumes about golf and the human condition. I got a phone call last night from a woman who identified herself and asked if I was the Mr. Blaisdell who is a rules official. I said yes and she said that her husband wanted to speak to me but I should be aware that he was heavily medicated. I thought, --What the hell is this?--A man came on the phone and said—Pete, you probably don't remember me but I used to play in a number of USGA qualifiers back in the 90's. The name did ring a bell but I really could not place him. 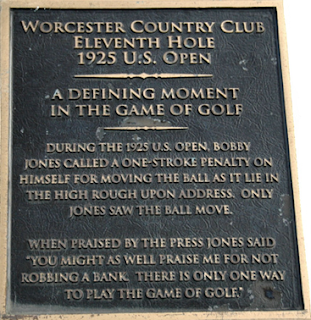 He said that there was a ruling at a Public links qualifier at Gardner municipal where there was a difference of opinion on a situation where two players had a heated discussion concerning a ball moved after address on the putting green. The man on the phone was the player involved and his fellow competitor was adamant that the ball had moved. I was not the first official but was brought in as a second opinion because the first official was not sure how to rule on this. It came down to a simple he said-he said and I ruled for the player accused. The man on the phone said --I have pancreatic cancer, I've been in the hospital for 7 weeks, nothing can be done, I came home to die. I want you to know that the ball did move and I cheated. I have carried this with me for years and I wanted to get it off my chest. It is the reason I stopped playing golf because I was so ashamed of myself. It is the only time in my life I cheated and I want to tell you I'm sorry that I lied to you and the other player. I told the gentleman that I accept the apology and that it took guts to call. I said I would pray for him.--This really shook me up. I wanted to share this. If you have read this with interest you will probably want to read the many varied comments that have since been posted on the web site. This is the link. Edit: I am sorry to have to report that this honourable gentleman passed away in January 2012. RIP. Of course this rule changes next year so if the wind moves your ball on the green there is no penalty. How anyone can be sure the wind moved their ball and not a wayward neutrino I guess will keep referees delaying play for ages. I have to point out that a player who has addressed their ball only escapes a penalty under the revised Rule 18-2b if it is known or virtually certain that the player did not cause his ball to move. It is still possible to incur a penalty, even on a windy day. Also, that it is not just wind that might move a player's ball, gravity may also be the cause of it moving (e.g. when the ball is at rest on a slope). Another point that I must mention is that most delays in tournaments where there are referees in attendance are caused by the players insisting on obtaining a ruling, because they are unsure of the rules, not by referees taking a long time to make a ruling.